Insiders will know how, when and where to attack and how to cover their tracks. Organizations need to apply a risk-driven approach through the correlation of risks – one risk to another risk to stay aware of potential insider threats. Risk Scoring Analytics from AlertEnterprise® provides organizations with a complete snapshot of risk profile of employees and critical assets to pin point malicious incidents before their occur. By having access to “Risk Profiles”, organizations can easily deploy controls and monitor user’s behavior and access patterns. Having access to Risk Profiles allow corportations to stay on top of potential insider threats and sabotate attempts by employees who might otherwise be classified as normal. Insider threat is always present and manifests itself in many ways. A malicious insider has the potential to cause more damage to the organization and has many advantages over an outside attacker: they have legitimate and often privileged access to facilities and information, have knowledge of the organization and its processes and know the location of critical or valuable assets. Risk Scoring Analytics from AlertEnterprise® encompasses the management of a Risk Profile for identities as well as for sensitive and critical assets. 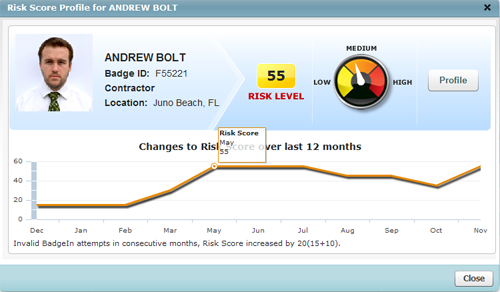 AlertEnterprise maintains a risk score that is correlated with an individual’s behavior to track anomalies or irregularities in every day routines of the individualautomates the upfront risk analysis allowing business managers to gauge risk and make decisions about how much access to grant certain individuals based on their roles. In addition, AlertEnterprise can also assign risk score to assets based on their criticality, location, usage history, access permissions and policies.